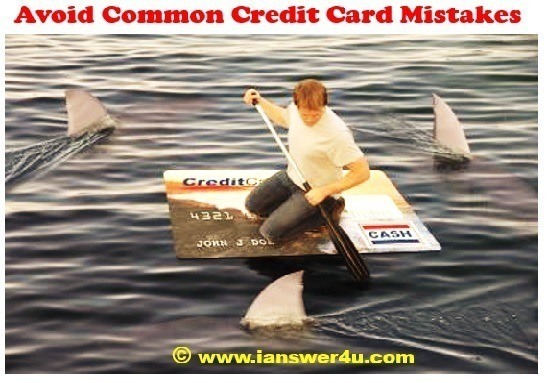 While busting shocking common myths about credit cards, I had discussed how a lot of apprehensions one has, are unfounded. Credit card enables safe and convenient option for payment of goods and services, both offline and online. Also, at the same time, contrary to general belief, it gives us an opportunity to increase our credit score. Not to mention various rewards and discounts credit card owners get at popular shopping joints. Now if you have decided to get a credit card, you might feel quite empowered and rich. To bust your bubble a bit, today I will discuss a few common credit card mistakes you should avoid. This is probably the most common mistake so many of us are guilty of making. After initial apprehension with respect to plastic money, we go on a hunting spree and collect as many credit cards as we are eligible for. I have seen people flaunting their cards as trophies. But we forget credit cards are not a source of income and each card comes along with an annual fees amount. Having a lot of credit cards can have a negative impact on your credit score. Also note that during dire situations wherein you are under a lot of debt getting a new one won’t be a solution; in fact you should rather find a way to pay-off your bills as soon as possible. Often people keep on collecting cards from different banks because of rewards and discounts each one provides. But don’t forget nothing in this world comes for free and more often than not banks are the ones who are getting better deal out of every transaction you are making. Often in order to lure you into buying a card, banks offer a period of low interest rate (also called teaser rate period). This period might range from 3 months to up to a year. Remember these rates are not permanent and will change once specified period gets over and real rates are way too high. It’s advisable to pay off your due during this period otherwise all the outstanding debts will be charged with retroactively applied interests from the date of purchase. Yes I too have been guilty of blindly signing off various policies without reading all the text under terms section, but have learnt my lesson well now. Don’t make this mistake because often, the devil is in the detail and bankers thrive on this mistake of ours. They often get away from tough situations citing those “microscopic” paragraphs at the bottom of application document. Read all the sections well before accepting them and ask the agent if you need any clarification. This is the cardinal sin as far as card payments go; in case you are doing this, be ready to face the consequences. Not only will you have to pay heavy late payment penalty, but your credit score will also decrease substantially. In fact it is this point which should raise the alarm and you should get your act together before you ruin your future borrowing scope completely. Don’t turn a blind eye to your monthly credit card statements. This will make you know where you are over-spending and in current scenario where Identity Theft is prevalent, you can catch the fraudulent behavior by checking statements thoroughly. Make it a practice to cross check every monthly statement you receive and keep a note of your spending. Unless you want to embarrass yourself in front of strangers and face the rejection at cash counter, spend within card limits. And the best way to achieve this is by keeping a tab of your account and being judicious in your spending habits. Studies on consumer behavior, over the last decade, have shown that people spend more while using credit cards as compared to when they use cash. The reason behind this behavior is that, psychologically we don’t feel the pinch of money leaving our pocket when we use card for swipes. Don’t fall for this irrationality of our behavior and avoid spending on unnecessary items. Still a large number of people use credit cards as debit cards at ATMs. STOP this right away. Any cash withdrawal from credit card is considered as cash advance by banks. Cash withdrawals can be considered as short term loans and they attract high interest rates. Use debit card for withdrawals save yourself from paying extra money to banks. Read more about revolving credit and bank overdraft. 11) Treating foreign transactions as domestic ones. Note that each bank and card has different exchange rates and transaction fees for foreign transactions. So while travelling abroad check which card gives you the best deal and use that card. Would you give a blank signed cheque to anyone? I think not. So how can you give your credit card or share its number with anyone? No matter what the situation is, don’t share your credit card details with anyone whom you don’t trust blindly. With the increasing number of financial frauds this is the very least you can do to safeguard yourself.